Split an HDMI audio/video source to two separate HDMI Displays, with support for HDMI 4K, and Power through a nearby USB port. The ST122HD4KU 2-port video splitter supports Ultra HD (4K) ensuring astonishing picture quality, four times the resolution of high-definition 1080p, while sharing a 4K HDMI video source between two HDMI displays.The 4K splitter is backward compatible with previous HDMI revisions, supporting 1080p / 720p HDMI video resolution devices such as computers, Blu-ray players and cable TV set-top boxes. Even if you don't require 4K video today, the video splitter ensures you'll be ready to take advantage of tomorrow's display technology while still working with the devices you already have. 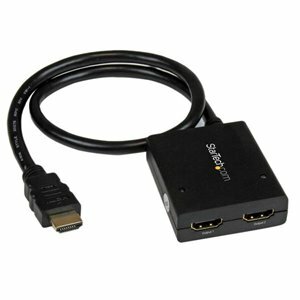 Plus, this splitter supports 3D, enabling you to use the splitter with your stereoscopic 3D video source on active or passive 3D displays.For a hassle-free setup you can power the HDMI splitter with the included USB cable, or power adapter depending on which is most convenient for you. Plus, the splitter features a built-in HDMI source cable, which lets you connect it directly to your HDMI source without the expense of additional cabling. Even if you don't require 4K video today, the video splitter ensures you'll be ready to take advantage of tomorrow's display technology while still working with the devices you already have.